With summer fast approaching, every weekend feels like the perfect opportunity to whip out camping gear and enjoy the great outdoors. Instead of spending the warm nights trapped indoors, it’s always a fantastic idea to experience the chills that one can enjoy while out camping. We’ve compiled a short brief overview of insightful camping hacks to ensure the experience is all the better. Wipes are essential when one is going camping because they keep one’s spirit energized with a back country shower, they are fantastic ways to freshen up, wipe off sweat and maintain sanitary surroundings at optimum about the camp kitchen and pit privy. There are numerous vendors who sell wipes like Epic Wipes, branded baby wipes, classic Wet Naps and flushable toilet wipes. It’s best practice to have items like extra batteries for flashlights, headlamps and satellite communicators; some spare laces for footwear; zipper repair kits; fabric repair tapes (duct tape or nylon-specific for tents and jackets); baling wire (when coupled with duct tape, they can be of a source of great convenience); and at least 5 meters of multipurpose 550 paracord. Since mosquitoes are usually more attracted to darker colors compared to brighter ones, it’s important to always dress appropriately. Brighter colors are ideal not only to mask from mosquitoes but also, for the backwoods since visibility between one individual to the next is heightened. Since it’s a camping excursion, it’s not really a must for one to have the large bottle of hand sanitizer, a tiny travel-sized bottle can do the trick. Having hand sanitizers at the ready helps prevent situations where happy campers experience tummy troubles. This is true despite most people naturally thinking that wilderness bugs like giardia are to blame. Alcohol-based sanitizers are ideal to use right after every toilet break and right before one partakes in a meal or snack. Hand sanitizers are essential because they have multiple applications other than just maintaining cleanliness standards. They can be put to good use as fire starters and in the treatment of wounds as an antiseptic. Most people tend to have Vaseline and a couple of cotton balls in their homes. Before heading out for a camping excursion, it’s best to pack a few of them. Once on site, the cotton balls need to be rolled up in Vaseline and stuffed in a bag. Once ignited, single cotton balls tend to burn long and hot over extended periods, thus saving the hassle involved when using other materials like paper. 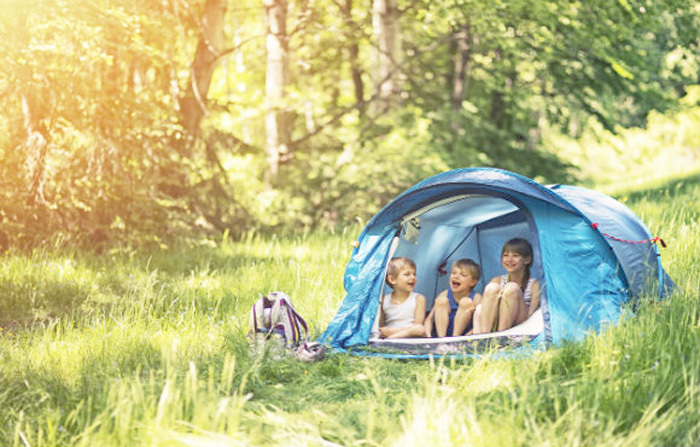 Before starting out the camping trip, we suggest checking out My Family Tent who offer great deals on camping tents. They are the best bet solution for quality tents to shield one from the vagaries of weather. Seam sealers can be used to upgrade any tent, whether ancient or recently acquired because they enhance the waterproofing qualities of tents. UV protectants can also be used on old tents to shield campers from harmful sun’s rays.